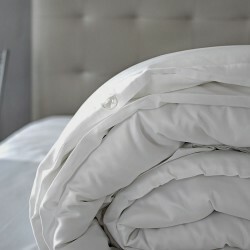 The 500 thread count Provence Collection is made with 100% satin Egyptian cotton. This pure white fabric provides an easy-care finish with a luxurious feeling of comfort. The simple, pure white cotton of the duvet covers, flat sheet and Oxford pillowcases make this Collection particularly elegant and durable. The pure white cotton has a fresh feel, bringing a softness to your skin at bedtime.